The folks at Airthings recently sent me one of their new NRPP approved Corentium Pro radon monitors to review, which currently retails for $1,499. This company had a booth at ASHI's InspectionWorld conference in January of this year and was previously called Corentium, but they re-branded about a month ago, apparently leaving the Corentium name to be specific to their radon monitors. It sounds like they're planning to get into other types of air quality testing, but I haven't heard any specifics yet. The Corentium Pro is a sleek-looking radon monitor that comes with a handy tripod mount on the bottom, obviously giving a much more professional appearance than the utilitarian upside-down 5-gallon buckets that my company currently uses for radon testing. It looks like a new, modern device... unlike most other radon monitors available today. It also comes with a USB cable and a nice padded carrying case. This device is powered by three AA batteries, which are supposed to be good for 18 months. I absolutely love this feature. The radon monitors that we currently use all need to be plugged in. This means that we need to keep an extension cord with every radon monitor. We also need to make sure that we're not plugging our monitors into switched outlets (ask me how I know). The power cords for our existing monitors also get damaged and occasionally left on site, so we're always having to purchase replacement power cords. All of that hassle is eliminated with the Corentium Pro. The batteries are supposed to be replaced annually, ideally at the same time that the unit is calibrated. Like any other electronic radon monitor, these units must be calibrated annually, in accordance with NRPP standards. Calibration is done through Bowser-Morner in Dayton, OH. 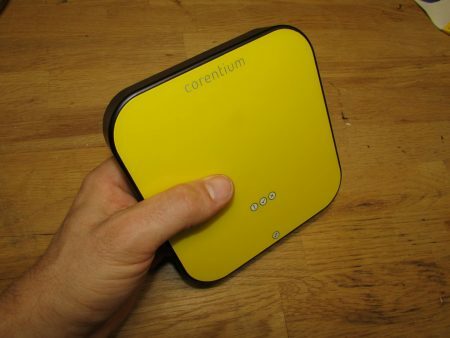 The Corentium Pro is designed to interface with either an iPhone or Android. This is probably the way that it should be, but it increases the potential for bugs. I dealt with a few bugs just trying to get my Galaxy S5 phone work with this device, and was told to update my app three days after I had installed it. That did the trick, and I was able to use the device. Connecting to the monitor using the phone app was intuitive and simple. I didn't need to read any instructions. One thing that seems to be lacking with the mobile phone reporting is a good way to determine if the device has been tampered with. Once the 'mobile' report has been generated, the report tells you whether or not the radon monitor has been moved, which could indicate tampering, but it doesn't give any specific information about the movements, which makes the information almost useless. If a child or pet simply bumps the monitor once during the testing, that's not critical information that would make me suspect tampering. On the other hand, if the monitor was moved a few hours after I set it up and moved again a few hours before the end of the test, I would be extremely suspicious. The mobile report doesn't give that information; it simply tells the user whether or not the device was moved, period. It should really tell users each time the device was moved. If it could also say how far it was moved, now that would be definitive, but I'm not aware of any devices that do that. The report that is generated through a PC interface does have the ability to show when the device was moved. We tested this device alongside a recently calibrated Sun Nuclear 1027 radon monitor, and the hour-by-hour readings were nearly identical. This is an easy-to-use, feature packed device that does everything you need and more. The fact that it's powered only by batteries is also a huge selling feature. The only big downside is the price, which might be too high for radon professionals to justify. I'd be willing to pay about 20% more than what I currently pay to get the additional features that the Corentium Pro offers, but this device costs nearly twice as much as what I'm currently using, which is the bare-bones Sun Nuclear 1027. The Android functionality is also currently too limited, but I'm sure that a software update will fix that in the near future.